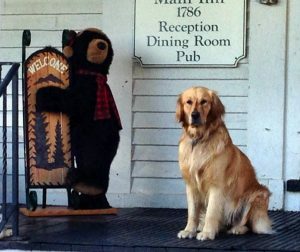 It can be difficult for the rest of the clan to relax and enjoy a Mount Washington Valley adventure – not to mention expensive – while putting the family pet in a boarding kennel. We know how much these precious creatures enhance our lives. Look no further than our resident greeter, Cookie, who delighted so many visitors during their stay over the years. Like us, you might find it challenging to sleep well without your faithful companion by your side. Your pet may also experience separation anxiety, so it’s good to have options that allow your dog to travel with you. Accommodations at our dog-friendly bed & breakfast at the Christmas Farm Inn & Spa include Elves in the Salt Box, as well as our cottages The Blacksmith Shop, The Sleigh House and The Log Cabin. The dog-friendly cottages include separate sitting rooms that work great for portable kennel storage. Unattended pets left in your room must be securely locked in the kennel, which is very important since our staff will need to access your room during your stay. All pets must be approved at the reservation stage and registered on arrival. All pets are subject to a $25 per night fee. We ask that pet owners appreciate that not all people are pet-friendly and some have severe allergies. Therefore, there are stiff penalties for bringing unauthorized pets into non-pet-friendly rooms. We have portable kennels available for $10 per day if you do not bring your own. Visiting pets must be controlled and on a leash when walking around the estate and Jackson Village. Waste receptacles are provided for the disposal of droppings and waste. Dogs can be a great addition to your own pack while exploring attractions like Jackson Falls or a large number of trails for hiking, biking and snowshoeing. Settlers’ Green Outlet Village is a very pet-friendly place to shop with dog waste bag dispensers located throughout the shopping center and dog-friendly stores marked with a sticker on the door. According to the website BringFido.com, the discounted and tax-free shopping center in North Conway even hosts a “Bring Your Dog Shopping Day” each summer with free leashes, goodies, a photo booth, and more. The Conway Scenic Railroad specifically welcomes well-behaved, leashed pets in Coach cars on both of its trains. If there’s something your family wants to do that isn’t well-suited for your dog, pet sitting services are available in Jackson for a few hours, a whole day or overnight. Some even provide photo and video updates so you can see how much fun your dog is having. We hope that you don’t need them while you’re visiting Jackson, but our front desk is happy to recommend local veterinarians. You want to have their medical records close at hand, including rabies vaccination records. Animals that have been microchipped may need some way to be tracked when visiting anywhere unfamiliar to them. To make sure you have the best experience traveling with a pet, the Humane Society of the United States recommends keeping the animal in a crate that has been anchored to the vehicle using a seatbelt or other secure means. Make sure your dog is always wearing a collar, ID tag and leash when exiting the car. Allow plenty of stops for the pet to exercise or relieve itself. And don’t ever leave the pet alone in a car, especially on hot days. Even a short time away can result in high enough temperatures to cause suffering, organ damage or death. Not sure whether to bring pets along or leave them behind with a friend or boarding kennel? Ask yourself if your pet is suited for travel due to temperament or physical impairments. You want your dog to enjoy the trip like the rest of the family. The stress of riding for hours and anxiety of being left alone in a strange new place may lead you to decide a pet is better suited staying in a kennel or with a sitter. Whether your own version of Cookie tags along or stays behind to give you a warm welcome on your return, we want your family to relax and feel right at ease.